How do I select the next lead to call? To be productive, agents need to be confident that no lead is ever missed. Leads should present themselves in a way that your energy goes into the sales pitch, rather than into worrying about whether there was a better lead to call. Is any lead due for callback? Pick that! Otherwise, pick the lead that has the oldest last-called time stamp, has not been locked by others (being called by others) and has not been claimed by others. 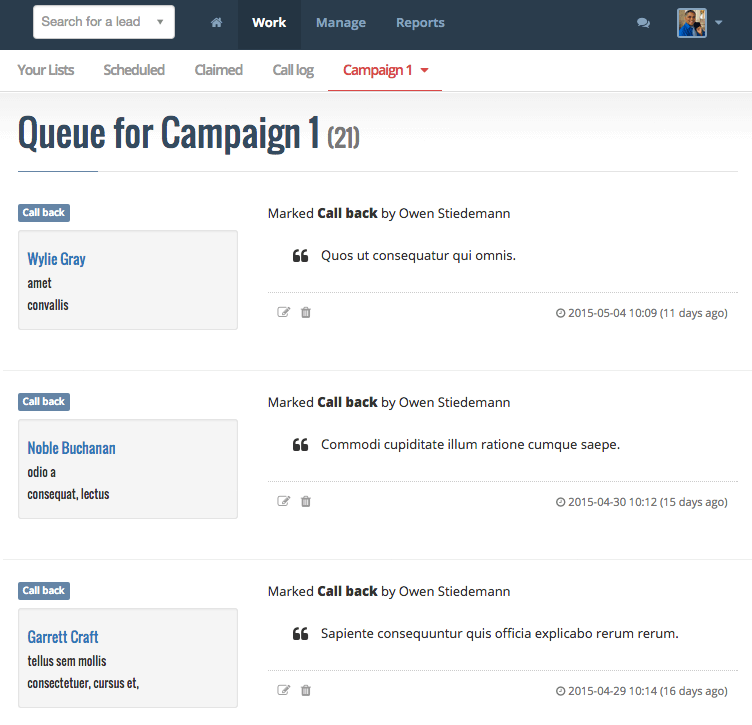 This ensures that all leads are called in the order they were added to the system, and that any leads scheduled for callback get shot to the top of the queue at the right time. It also ensures that leads that are being called right now or has been claimed by other agents are not picked, making it possible for multiple agents to work on the same list without the risk of clashing. The queueing works on a list-by-list basis, so when you are calling leads in one list, you'll only get leads queued from that list, until you change lists. The myphoner queue view. Upcoming calls are shown here in prioritised order. 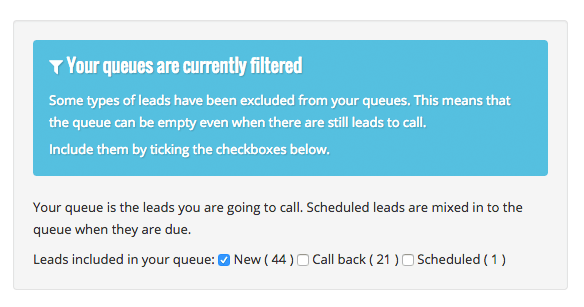 Filtering your queue is useful if you want to focus on for example only calling new leads for some time. Please note that queue filters are global, so once you have activated the filter, it affects all your queues in all views that rely on the queue. We will show you a warning and put the icon anywhere it affects your view. Pro Tip: To filter a list with more advanced conditions, check out Lead Segmentation. 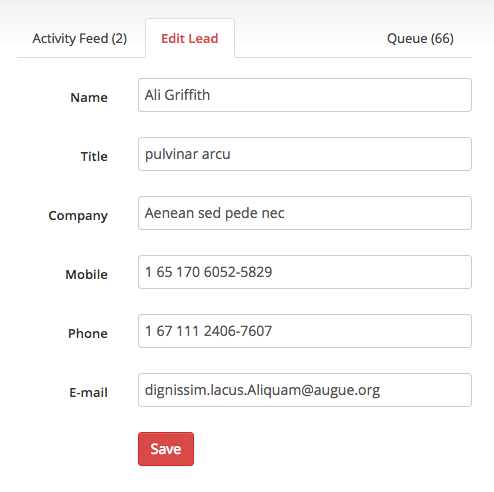 You can filter certain leads from your queues - useful if you for example want to focus on new leads for some time. 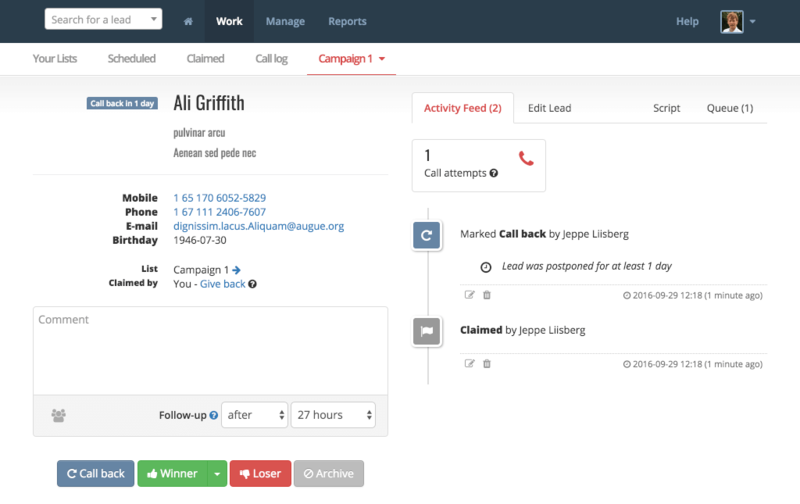 Click on Call in the main menu to get to your work dashboard. The work dashboard is your overview of the lists you can work on, ordered by the last worked. To get started working a queue, click the button on the list you want to work on. Then myphoner will open the first lead in the queue of that list. The ... button opens a menu with more options for the list. Start working your queue from the work dashboard. The lead view is your primary working space and lead nurturing interface in myphoner. This section will explain each part of the view in detail. Pro Tip: Access the current lists' context menu from the highlighted submenu item to add a new lead to the list (and more). The lead information is the information you have configured to be shown in the list configuration. The fields you have given a link type are clickable. Go ahead and click on the phone number and see if it launches your locally installed phone. If not, you might need to do some troubleshooting before you are ready to call. Click the email link to send an email from your own email client. Your myphoner Email Dropbox address will be inserted in the bcc field and thus record that email to the activity log in myphoner. The list that the lead belongs to is also shown here, and if you have the proper access rights, you can move the lead to another list by clicking the icon next to the list name. Last but not least you can manually claim the lead if it is not already claimed. If you have already claimed the lead, this is where you can give it back. 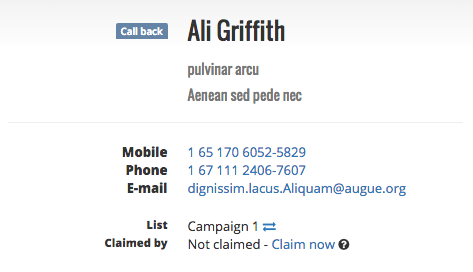 If the lead is claimed, information about who claimed it is shown here. If a lead is claimed, you can only edit and action it if you have certain admin rights. If not, you'll be shown a warning and the lead will be disabled for you. This sometimes happens if you look at a lead coming from a search or a list view, that is not your queue. As long as you are working your queue, leads claimed by others will never be shown to you. Lead information in the lead view. myphoner activates the voip phone (dialer) installed on your computer when you click a phone number, so you need one installed and ready to dial real phones. You can find the complete guide on our Configure and Use a Dialer page. Below the lead information, you find the comment field, follow-up selection and action buttons. Comments: The comment field is for you to put any notes about the lead you might have when talking to the lead or after a call attempt. These comments will be added to the activity log once you press one of the action buttons. Follow-up: The follow-up selection affects when you get to call back the lead and how you'll be notified about it. Selecting after will simply postpone the lead and put it back in the top of the queue at the time of follow-up. Selecting in exactly will prioritize the lead in the top of the queue when it is due, and send you an email notification* within a couple of minutes after it becomes due if you are not already looking at it. Leads scheduled for an exact followup is listed under the "Scheduled" submenu. * In order to receive email notifications about due leads, you need to enable those in your notification preferences (enabled by default). We recommend choosing in exactly for leads that you agreed on calling at a specific time and after for the rest. Note: By default, we ignore follow-up times for anything but call backs. If you want to set a follow-up time for a winner or loser (which can be useful if they are later migrated), you must select a follow-up that is different from the default. Archived leads are never set for follow-up. Pro Tip: You can customise default call back times from your preferences. Click the user icon to the upper right and choose "My Preferences", then "Working". When you press an action button, an event is created in the activity feed and you are immediately taken to the next lead in your queue. Hint: If you have changes to the lead itself, you should edit the lead beforepressing any action button. You can safely open the edit tab and save the lead without loosing any comments you made in the comment field. If you choose Call Back as your action, the lead will return to the end of your queue, unless you have chosen a time for follow-up from the drop-down, in which case the lead will be injected to the top of your queue at the time of call back you chose. Hitting the Winner button will mark the lead as won and take it out of the queue. You can later export and/or move won leads to another list for further work. Pro Tip: Make one list for each step in your pipeline. Mark leads as winner when they complete that step (e.g. Meeting Appointment made) and Migrate Leads Between Lists, setting their state to 'Call Back' to move them into the next step in your pipeline and re-inject them into the queue. Set a follow-up time for winners, and they will be scheduled for that time after being migrated to the 'Call Back' state. Note: Selecting a time for follow-up will not inject a won lead into the queue, but can be useful if the lead is later taken to another list and put back into either the Call Back or New state. Use the Loser button when the lead has denied accepting your offer. You can always migrate losers to a "Follow up in six months"-list if you resist losing them for good. Instead of deleting invalid or unusable leads, the Archive action hides them from your queue but keep them in the database, so we can detect and warn if they are ever imported again. If you really want to delete one or more leads, you can first archive them (optionally by category), then move them to a new list using the migration tool and then delete that new list entirely, since leads will be deleted when the list they belong to is deleted. Pro Tip: Enable segmentation of leads with categories and get more flexible migration and export options. See Configure a List. The different lead actions you can choose between when finishing a call. The activity feed provides an overview of the activity for this lead. It makes lead tracking and nurturing easy as you can always see what happened recently as well as further back in time. Most importantly, it shows you how many call attempts has been made since the lead was imported, created or last migrated to the New state. Events in the feed are ordered so that the newest events are at the top. You can edit the comment for an event by clicking the icon below the event, and you can delete the event entirely by clicking the icon. Warning: Deleting events will affect statistics and reports. Only do so if the event was a mistake! 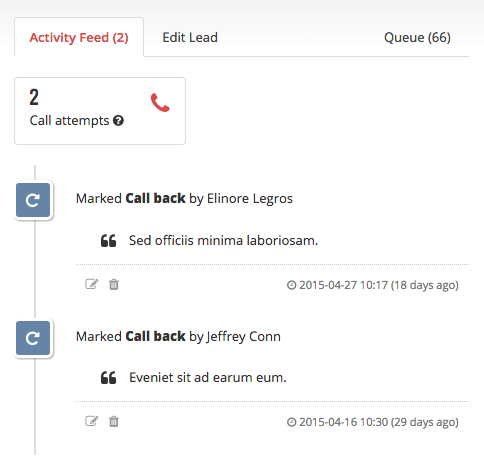 The lead activity feed shows call attempts for the lead and a log of events, newest on top. If you are adding information, or want to change it, open the 'Edit Lead'-tab and go ahead. The lead is updated once you press Save and you can safely do so, even if you have started typing comments in the comments box above the action buttons.